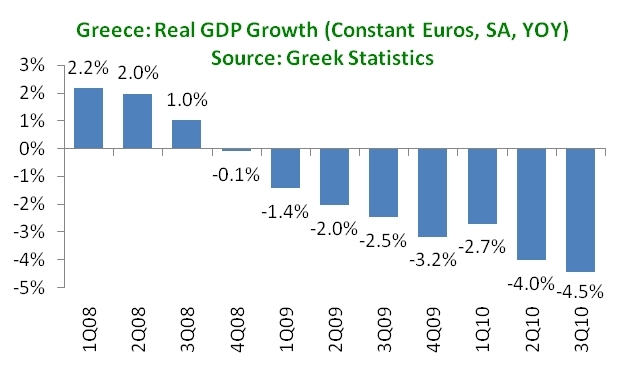 The Greek statistical authorities just published their estimates for GDP in the third quarter of 2010: in real terms, the economy declined by 4.5% relative to Q3 2009 and by 1.1% versus Q2 2010. The authorities note that “the GDP rate of change between the quarters of 2009 and 2010 should be treated with caution, due to the discontinuity of General Government data series.” Still, this is not good news. However, the economy is shrinking at exactly the rate that it is supposed to be shrinking. The Greek economy has been shrinking since Q4 2008. What is more, the rate of decline has consistently accelerated with only one data point – Q1 2010 – showing less decline than the previous quarter. In 2009, the economy shrank by 2.3% with the end of the year being worse than the beginning, and in 2010 so far it has shrunk by 3.7%. It is important to understand, however, that this decline is exactly what the troika forecast when it agreed to lend money to Greece in May 2010. In fact, the real GDP growth forecast has not yet changed between what the authorities forecasted in May 2010 and what the government announced in its 2011 budget program in October 2010. Some data revisions may change that in the future, but the point is that the economic is shrinking exactly as planned. Looking at that forecast shows that the 3.7% GDP decline so far in 2010 is very close to the 4% decline that the program assumes. Nor is the program sanguine about things getting better. In 2011, the economy is supposed to shrink further by 2.6%. 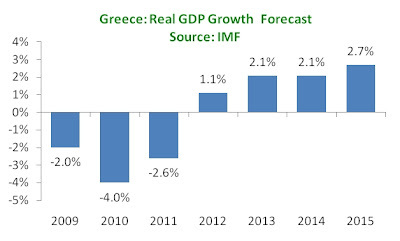 It is not until 2012 that GDP growth will resume and even then the growth is assumed to be anemic at 1.1%. 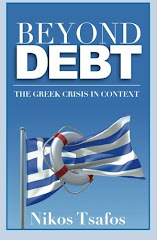 By 2013, the program expects the Greek economy to start increasing at healthier rates, above 2%. This, then, is the most depressing and difficult part about the government’s handling of the program. The economy is performing more or less as expected and the squeeze felt by households and business is in line what was supposed to happen, which means one can hardly blame the government for things “going wrong.” And in fact, we still have at least another year of worsening conditions before things get better if all goes according to plan.